Maniac Mansion Deluxe Game Review - Download and Play Free Version! A fun and free tribute to one of the best adventure games ever made! Unique design that uses three characters interchangeably to beat the game. Each character has different strengths and weaknesses so each time the game is replayed with a new character new obstacles and challenges will be faced. Very easy to fall into traps that completely inhibit one or more characters, rendering that game unbeatable. No menu to control game options such as saving and quitting. Some very odd and unexpected uses of items that makes it difficult to know which objects to pick up and add to the inventory. As with most older adventure games, there is no hint feature in case you reach a road block. 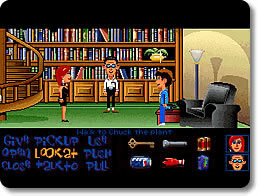 Editor's Update (10/23/14) - Maniac Mansion is an old game that used to playable with the SCUMMVM emulator. However, the game has been taken down and is no longer available. Remake of one of the greatest adventure games ever! Adventure gaming was forever changed by the arrival of Maniac Mansion. Now a few decades later, the team at LucasFans games brings a classic back to life! Your friends have wandered into a spooky old mansion owned by a mad scientist. You must get them out, find out what the crazy mad man is up to and stop his evil plans! Maniac Mansion Deluxe is a fantastic tribute and remake of one of the greatest adventure games of all time: Maniac Mansion. The game play is impressive and as close to the hilarious original as it gets. From the clever dialog to the rewarding puzzles, this game is a treat for old and new players alike. Take a fun trip back to a golden era of adventure gaming with Maniac Mansion Deluxe! If you are looking for more hilarious adventure games, try Bone or Sam & Max Season One! Help Dave and his gang of friends save his girlfriend Sandy from the perils of Dr. Fred and his freaky, evil experiments. Maniac Mansion throws you into one of it's characteristic traps from the very get go. Once you are able to get into the mansion, one of your characters will stumble into the misfortune of being locked into a dungeon by Nurse Edna. This trap is set off by walking past the kitchen sink and unfortunately it is pivotal to have at least two characters free to beat the game. There are several similar traps that slowly deplete characters which forces you to restart the game. Each of these traps may be easily solved, but learning how can be difficult which will cause many players to shy away from the challenge. One major downside is that there is no game menu to control saving, quitting, and other such options. Be sure to read the online “Readme” to learn important features that are controlled by hot keys such as F5 to save. Learning which items need to be picked up can also be tricky as there is nothing to indicate which items may or may not be needed. For example, to win the game the Pepsi can and used batteries in the refrigerator must be added to the inventory, while grabbing the molding cheese will eventually halt any further progression. With no hint feature to point you in the right direction should you become stuck, be sure to pay attention to every name and description that appears over the cursor as your mouse moves over each item. Overall, casual players are advised to steer clear of this game as it's reliance on hot key memorization, elaborate traps and lack of helpful hints will leave you frequently stuck and forced to restart, ultimately becoming too frustrating and causing boredom. However, the more experienced adventure player will be stimulated by the unique challenges presented in those features. Although you can expect to restart the game at least several times, it is a fulfilling experience to reach the finale and master all of the clever nuances.